The Bombshell Swimsuit in Burgundy by Pinup Couture - The "Bombshell" by Pinup Couture is a vintage-inspired one piece swimsuit made of high quality, shiny swimtech fabric. Taken from Old Hollywood style swimsuits, the Bombshell has a padded bust with a pleated overlay, with a thick elastic band for bust support. The front of the suit is lined with a strong powermesh panel to smooth the tummy. 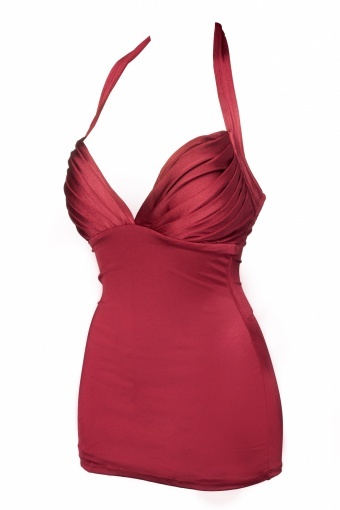 Feel like a true 1950s Hollywood starlet in this amazing vintage reproduction swimsuit!